Hi loves, it been a minute. Lots happening keeping me busy from family affairs to work and life in general. It’s been a while, so let’s pick up right where we left off on the home project. There’s been major progress on our first home and moving is not too far away. I can't wait to share that but don’t let me jump ahead of myself. In the last post I talked about how we choose building vs pre-owned and how we choose the community we ended up in. We did a bit of research going into this whole process and lucky enough for us we have a realtor in the family so that helped with the pre-work from budgeting and financing and knowing what you can truly comfortable afford. Knowing what the lender is looking for and putting the numbers together even before we got there so by the time we get there we can't be swayed wrongly. These includes basic things like our credit scores, debt to income ratio, loan option types, rates, taxes and such. I have to say it felt good knowing all that information ahead of time as opposed to working into it blindly and getting surprised . Anyways, let’s move on, that’s the boring part but I suppose most crucial part of the whole process. One thing I did learn as we progressed in is that when buying, the price is not set in stone. You can put in your best offer and negotiate until you both come to an agreement. Building is quite the opposite. There is no going down or negotiating; the base price is set and there’s only going up from there. One of the most important things to keep in mind when looking at new build listings online is that the price listed, which is the base price pretty much includes nothing, literally; unless you’re buying a model home. Everything from flooring to lighting to door knobs are all add on/ extra. So picking the right floor plan at the right base price is very important because you can easily spend close to you base price in upgrades and picking design features and element of the house. I couldn’t be more pleased with the builder we choose. They are easy to work with, very responsive and on target. Prior to deciding to build, I’ve heard horror stories of builders especially tract builders; being behind schedule and not meeting their timelines, but ours has been pretty good. I guess I'll call them semi-custom builder. Reason is that I feel they offer more opportunities and range of options to personalize your home than a regular tract build. Now on to the process, keep in mind the process we’re going through is going to be specific to our builder as I'm sure they all have their differences. Like I mentioned in the last post, the first step was meeting with the builder to pick a lot and that same day, we signed the contract, designed the first phase which pretty much entails the structural part of our home. This includes choosing from an existing option of floor plans and making any changes we want as long as it is allowed for that plan; like adding extra rooms, adding additional level up or a basement, adding square footage, upgrading kitchen to a gourmet kitchen, upgrading owners suites and pretty much anything structural and finally picking the elevation style and outer color scheme of the home. The next phase was going to the design Center meeting that lasted four hours even though we've already done our homework and knew exactly what we wanted going in, it still took that long. That so far is my favorite part of the whole process, well until we move in. So at the design Center, the best thing I think we did and I can't stress it enough is one, going in with a budget and two, knowing what we want. 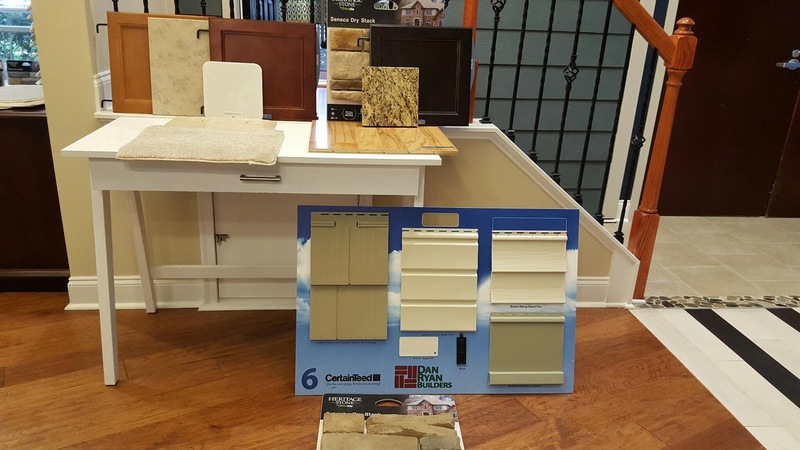 Once you get there, it is so easy to start pointing to stuff that of course looks great and then you quickly realize maybe a 10,000 counter top is just not what you need right now. Design center selections are pretty much the whole interior of the home. From flooring, tiles, vanity style, faucet, lighting, window treatments, paint, counter top, knobs, fireplace finishing, cabinets, you get the gist. In almost all the selections in these category, the builder offers one or two base options for free but of course you rarely pick the free stuff because they don't look just as nice as what you want so you upgrade to level 1, 2 or 3 options. There was one category we actually surprisingly went with the base option because it was not so bad when we saw it in person as opposed to the pictures online. So I mentioned earlier you can't really negotiate the price on anything with a builder but what you can go if you get a nice enough sales person and are good at either charming people or know how to talk is to get the sales person to throw a few things in "for free", and the design Center is the best place to do that; little things, not huge things. Since we came in with a list, I had my must haves and wish list and at the end of the day due to some miscommunication on some of our paper work on their end, the lady was able to pull in a couple of my wish list items at no additional cost. That sure made my day, as if I wasn't excited enough that we get to pick all the finishing touches in our first home. By now your home price is almost twice as high as what you started with having just the base price. They tell you all your selections are final at this point. You can change some, not all if you want but it will cost you. They can't really start anything on your lot until all your selections have been made both structural and design. So, the earlier you get into the design center and finalize your picks, the earlier they can get to work. Next is the pre-construction meeting, which is usually few days to a week before they are scheduled to break grounds. Here you meet your project manager and go over all your selection one more time. That's pretty much majority of the process. Now you just stalk the progress on a weekly basis like we did and watch a bare ground get built up into your home. The other meetings prior to closing are not that time consuming but just as important. Will cover that in the next post and hopefully move on to the event more fun part, decorating, from there.